If these two don’t just make your heart happy whenever they are together, I submit that you simply do not have a heart. These two are crazy in love with each other, they are best friends, and they have that super dorky kind of love that I aspire to have in my own life. Nothing made the world feel more out of balance than that period on HIMYM when Lily broke up with Marshall and moved to San Francisco. Luckily, that period didn’t last long, the two got back together, got hitched, and started making adorable babies. Marshall and Lily, Rockin’ It Since ’96. That 70’s Show was my all-time favorite show in high school and college, and a great deal of that was because of these two weirdos. The show’s ending left Eric and Donna’s fate together a tad ambiguous, I like to think that the kiss the two share at the very end of the finale was the start of their rekindling romance–of course, Donna still goes to college and shakes up the world, it’s just that Eric sticks by her side this time. Okay, these two didn’t end up together, which I consider a CRIME. This is really my only boat-rocking OTP. On the show, Jackie ends up with Fez (Fez? Really? ), and Hyde marries and divorces a stripper (okay, that one makes a bit more sense). I absolutely HATED that the showrunners broke these two up. I thought Hyde and Jackie were so great together. They were an unlikely couple, sure, but they proved to be so good for one another–which was really surprising. Hyde was able to get Jackie to come down from her high horse, and Jackie was there to push Hyde to reach his potential. They made each other better, which is what you want in a partner. Way back in the earliest seasons of the show, they made it clear that Jackie and Hyde were meant to be. These two. I just love April and Andy together. I mean, just look at how happy that sweater swap is making April. He’s goofy and lighthearted, and she’s deep-thinking and mildly terrifying. On paper, their relationship should most assuredly not work, but it has been one of my favorite things to watch on Parks and Rec. Who are your OTPs? Let me know in the comments! 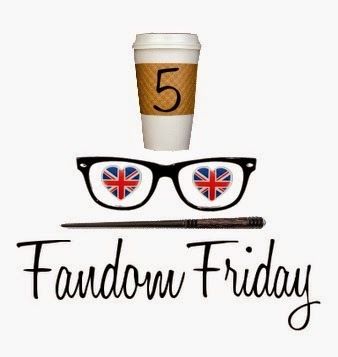 And, as always, be sure to check out my other Fandom 5 posts and see what others are saying by following the #Fandom5 hashtag! Torchwood’s Tosh and Owen. Still breaks my heart! aww I love Marshall and Lily! Actually I love your entire list! Aren’t the adorable? Love ’em! Right? They were so great together. And as for April and Andy, I feel like you can’t help but love those two goofballs. Yes to all of these! 100% yes!! I am so happy to see JD and Elliot on multiple lists…not alone in my massive Scrubs fandom!! I literally can’t watch that video montage without crying. ALL THE FEELS. I’ve just started Parks and Rec, but I’m at the point where it’s inevitable Andy and April will get together and I love it. Yay another Scrubs fan! Also, all I want from life is a relationship like Marshall and Lily have. ANDY AND APRIL! I just binged watched this show last month and love these two. I really like how they didn’t draw out getting them together. They started dating then married almost as fast. Perfect. I also like how the show hasn’t used the old stand by of pulling couples apart to create conflict.